In January I signed up to be a Rover sitter. It just seemed like the logical thing to do. I love dogs and my dogs love dogs. It took over a month until someone contacted me, and Jasper was my first guest. He only needed to stay one night, so my first experience was short and sweet. In less than 2 weeks, I got 3 more inquires. Two of them weren't very good fit, but Buddy was a good match even though he's not crazy about big dogs. He was mostly fine with Kelsey as long as there was some space between the two. We went to Pt. Isabel a couple times during Buddy's stay. The first time I kept him on the leash. It was pretty obvious to me that he's not the kind of dog just runs off. The second time I just let him off leash. He runs fast. Both Cracus and him run super fast but they always make sure to stop and keep me in their sight. After Buddy was picked up by his person, Cracus seemed a little confused and sad. 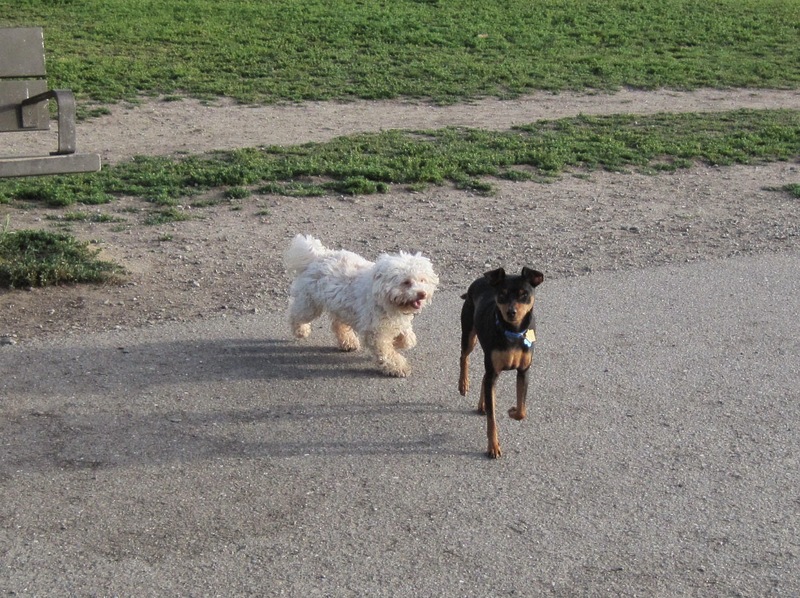 He was just playing chase with Buddy a few minutes ago. Now Buddy has gone home. If you are ever looking for a dog sitter, check out Rover.com and use my discount code "CATALINA20" to get $20 off as a new customer. The code is good for any Rover sitter. Isn't it a sweet deal? Cracus is becoming quite popular at Pt. Isabel, where I take Kelsey and him for walks several times a week. While everyone likes Kelsey and thinks she's just beautiful, Cracus makes people laugh. The shaggy hair, constant grin, pink nose, and dancing on his hind legs just bring smiles to people's faces. Some people actually just crack up at the sight of Cracus. One of Cracus' best friends at Pt. Isabel is a little male chihuahua. Even though he looks small, he is quite feisty. He has to be feisty in order to counter attack Cracus. Some owners get a bit worried because Cracus gets overly excited when he's playing then he starts making this growling sound. I have seen Cracus rolling a few times because he was running so fast. He just turned into a white fur ball and rolled on the ground. Someone at Pt. Isabel called him "Little White Dancing Bear." I guess he does look like a little teddy bear with that hair. I have tried to give him a haircut, but he's still fearful of the clipper. So far I have not been able to trim the hair on his legs. I recently saw a great Youtube video called Happy Dogs and Cat in Australia and decided to make one of my own. I call it Little White Dancing Bear featuring Cracus and his friends. Lately it seemed like many birds have been hiding in the plants along the walkway to my backyard gate. Every time I am sweeping or pulling weeds or doing whatever near the gate, some bird would flop its wings and startle me. Today I was trimming the overgrown vegetation, my next door neighbor called out my name. She wanted to let me know that some mourning doves are nesting right in the bushes. Now it all makes sense! As we were talking, surely enough, some bird flopped its wings and startled both of us. She told me the nest is at the same level as my window. I was excited. I could observe birth of some baby birds right through my window. After the conversation, I got on my back porch looking for the nest. Suddenly I saw an eye staring back at me. Somehow it looked like a fake bird because it wasn't moving at all, so I got closer. Suddenly, it flew away making a lot of noise as it took off. I guess it was real. I was able to see the eggs the bird was sitting on. I waited for a while, but the bird didn't come back. I was a little worried. I went get dinner and went back to look at the nest through my window this time. Ah, the bird came back and was sitting on the eggs again. I almost feel bad for the bird because Cracus barks a lot sometimes. The bird has to endure a lot of noise. Perhaps the bird likes it because the dog would alert it if any danger comes. The nest is more than 6 feet above the ground, so I can't see it when I am outside on the ground level. Once I come inside, because the house is elevated, I am able to see it at the eye level from the window. This is perfect. The bird doesn't get startled when I watch it from inside. Yesterday afternoon as I was heading over to Sacramento, an acquaintance of mine asked me if his dog could stay with me overnight as his family wanted to go out of town. I told him that normally I would love to but I wouldn't be back until after 6 p.m. He thought about it and asked me if I would be comfortable to pick up the dog on my own after I return from my day trip. I was okay with it. I was pretty sure I could get the dog even though I never met him before. By the time I got back home and got the direction to the house, it was 8 p.m. The little dog was probably confused and sad. He barked me a couple times as I entered the house. As soon as I got a hold of his leash, he was happy to go with me. Since I didn't know the dog, I put him in Cracus' crate on the way home. I could hear him whimpering in the back. Cracus and Kelsey was excited to see the new dog especially Cracus. He wanted to play rough house immediately but Jasper was too timid. He just got here and didn't know us. This morning, I put the dogs in the car. Cracus always rides in his crate. Kelsey rides next to Cracus' crate. I was going to put Jasper in the back, but he immediately moved himself to the passenger seat and was quite comfortable staying there. Okay, now I know why he was crying last night on the way to the house. He is a front seat dog! Point Isabel is our weekend stop. We either start our day with Pt. Isabel or end our day with Pt. Isabel. It was a bit of a challenge trying to keep both Jasper and Cracus on the leash. Cracus is a spaz. He just can't walk a straight line. Finally I just let him run off leash even though potentially he might get ticks on him again. A few nights ago I found an engorged tick on his face, and I had to remove it. It was the first time I ever found an engorged tick on my dog and removing it. Cracus completely flipped out and bit me several times although he didn't break my skin. For days he was scared every time I tried to check on the tick bite on his face. Anyway, I decided that I can't just keep Cracus on the leash forever. Dogs are meant to roam freely sometimes. Kelsey was a bit jealous of Jasper. Since Jasper was our house guest, I naturally paid more attention to him. I wanted him to feel loved while his humans were away. Kelsey actually growled at Jasper every time he got too close to her. I was pretty surprised that by the early evening, Jasper was sharing Kelsey's bed! It took Cracus at least a week to lay next to Kelsey on her bed. Around 7 p.m., Jasper's humans got back in town and picked him up. We are going to miss you, Jasper! Ever since we moved into our new home, I have been thinking of installing a screen door for the backdoor so that on warm summer days and evenings I can leave the door open. However, my budget is extremely tight after getting the new place. I started thinking about how I could make a screen that just hangs over the door. It suddenly occurred to me that perhaps there already is such a product on the market. I Googled for "portable screen door" and sure enough there are several similar products on the market already and some are very affordable. Next step was for me to compare these mass manufactured mesh screens. At first I looked at Magic Mesh Instant Magnetic Screen Door which is a As Seen on TV product. It has mixed reviews, and its main complain seems to be the stress on the top Velcro strip that hangs the screen to the door. While I know there isn't much human traffic here, Cracus just loves to run in and out of the house. He is another reason I wanted to get a screen door. I am tired of opening and closing the door for him. If he knows I am home, and he's outside, he would go nuts at the door until I let him in. On the other hand, if he thinks I have left the house, he would just stay put until I get home. I don't want to buy a cheap item and only to find it coming off in a few weeks, so I also looked at Bug Off Instant Screen Door, which has a retractable bar on top to hold the screen up. It looks pretty good and gets very good reviews. I was just about to get it, I saw iGotTech #1 Best Screen, which is cheaper than Bug Off but a little more than Magic Mesh. iGotTech is very similar to Magic Mesh except it comes with a lot more Velcro that covers entire frame and has highest quality, durable mesh. It also offers a guarantee. At the last minute, I canceled my Bug Off order and changed it to iGotTech screen. It only took seconds for both Cracus and Kelsey to figure out that they can walk through the screen. Cracus just runs in and out of the house with all his hair flying. I also discovered that there is some metal components in the door. When the screen mesh flips up too high, the magnetic part could get stuck on the door. Solution? Open the door half way. By opening the door half way, Cracus would just run through the piece that's further from the door and leave the other piece almost untouched. Problem #2 is that I knew Cracus would just destroy the screen if I leave it hanging all day while I am at work. I would have to either take it down entirely or hang it up somehow so he can't reach it. I figured out a way to only stick the top panel of the screen half way on the Velcro strip. Before I left the house for the day, I lifted up the mesh panels and stick the sides to the unused Velcro strip on the top as shown in the above photo. My only concern was that if the backing of the Velcro stripe wasn't sticky enough, the whole thing could fall off. It would then be destroyed by Cracus. However, I thought it was unlikely since a lot of the weight was still distributed on either side. I got home today after more than 8 hours at work and was relieved to see the screen held up. This is going to be awesome.